That sounds very like an invitation to your next show. Must be either Southampton or Bath you have in mind? :(Now, why didn't I book tickets! .Its a 4.7Mb wmv file. ...............Romanza060202.wmv..............and is not quite complete but lovely just the same. 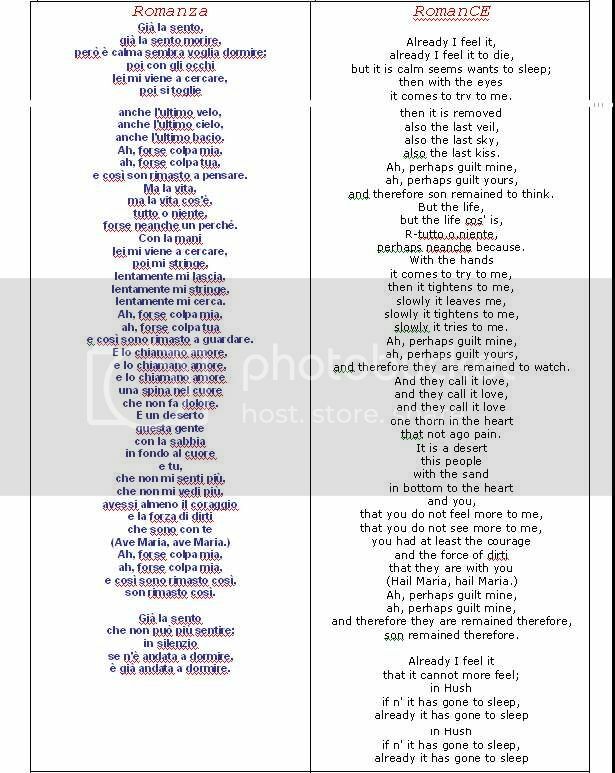 Here are the Romanza Lyrics roughly translated from the Italian into English. I didn't bother to hone up the English as I think its very easy to catch on to the theme. Namely, love that has faded & the disappointment accompanying that. Whose fault is it? Is it mine, is it yours? The grief of losing such a lovely feeling......... boo hooooo etc. hmmm I am wondering if you are trying to audition to do a duet with Hayley?? Abmusica.com is very good. It contains the translation of almost every album songs that Bocelli has sung. almost every song Andrea Bocelli's sung? That's a lot! Who's ready to make one for Hayley- I'll make an every picture site if anyone wants me to! Just PM me about it! you bet she would! and the Japanese fans (plus Eugene) have heard it! The problem with "You Raise Me Up", and quite frankly many of the songs Hayley as already sung is that there are so many versions of them out there that it creates two problems for her. First, if I hadnt heard of Hayley, and I already had four versions of YRMU, why on earth would I be interested in acquiring a fifth? Second, any song like that will inevitably have people who think that (name your singer) 's performance of it is definitive, and that Hayley's simply doesnt match up (see "Wuthering Heights" and Kate Bush). This isnt intended as criticism aimed at Hayley by the way - it is a shortcoming of the classical crossover genre as a whole. Look at the discography of Sarah Brightman, the early Charlotte Church and Hayley - and see just how many of the same songs at least two of them have recorded. How many versions of "Ave Maria" or "Danny Boy" does a record collection need?? The more times a song is recorded the higher the bar is set for the song to succeed. I think that she would be better off if her future releases contained at least half original material. I think that any covers should be carefully chosen - songs she can do something unique with in her style that havent been covered within say the last 10 years. Personally, I think that Hayley should be allowed to sing as many recent covers as she pleases. Anyway, you get get rid of all your other versions of songs and just keep the Hayley ones! I don't think that Sarah's or Charlotte's versions sound ANYTHING like Hayley's, by the way (BTW). I can appreciate both sides of this argument and I agree that many songs are labelled as being "done to death", but I wouldn't like to have to decide between those and the ones that are "worth doing one more time". There are quite a few songs that Hayley sings that I like because Hayley sings them, and that's not "just because it's Hayley", but because of the special quality of her voice. For me, perhaps the best example is 'Danny Boy' which I never liked until I heard Hayley's treatment of it. 'You Raise Me Up' is a song I hadn't heard prior to the CW DVD and I just fell in love with it. I've heard several versions since and I would love Hayley to do it. Not everyone is going to have heard every version of a song, even if it has been done to death and I agree that these have to be chosen carefully. I would like to think, however, that Hayley would consider any song suggested by fans in these threads for 'possible' inclusion in future albums. Personally, I prefer a mixure of cover versions and new material. Of course, I am always going to buy anything that Hayley records, so for the sake of this discussion, I will speak generally about any other artist in whom I have only a secondary interest. If they release an album of entirely new material, I am unlikely to buy it. If that album includes a handful of well-known "classics", I am far more likely to buy it. At the moment, I can think of no finer example of a well-known "classic" than 'You Raise Me Up'. Personally, I prefer a mixure of cover versions and new material. I remember Will (Martin) telling me that for his debut album, UCJ was adamant about including 'classics' that everyone knows because people are more inclined to buy songs they know by new artists rather than new songs by new artists (too risky!). However, his record company said straight away "no" to songs like 'You raise me up', 'Nella Fantasia', 'Nessun Dorma' or 'Ave Maria' because obviously the number of different covers has been too important in the last couple of years. It's only in his second album that new material and original songs will be included for the simple reason that the public will be more familiar with his name. I believe Hayley is keeping the right balance between old & new at the moment. She did extremely well at each of her attempts to cover an already well-known song so I personally wouldn't mind to hear her own version of 'You raise me up'. That said, I suspect that she will progressively add more new songs than 'classics' in her albums. I certainly won't mind that either! I suspect that she will progressively add more new songs than 'classics' in her albums. I certainly won't mind that either! Hi Stephany and everyone, I am sure that's true. One problem for Hayley is that she is promoted in the UK as a classical singer but of course, the number of classical songs suitable for her voice is even more limited than the broader category of 'classical crossover' that You Raise Me Up falls into. It's a classic but not classical. Most classical crossover acts run out of suitable 'classical' material after a few albums and I think Hayley will be no exception. It is only a matter of time before Hayley has to join the ranks of Andrea Bocelli, Russell Watson and Katherine Jenkins by releasing an album that does not qualify for the classical charts in the UK. The question is: when that happens, and it could be her next album (who knows? ), what will be the overall style of that album and how well will it do in the UK, compared to her previous 'classical' album? In other words, What songs do you want/think are on her new album? Personally, I don't think its 'feel' will be markedly different from Treasure, just a slow evolution that may be just enough to stop it qualifying for the UK classical charts. In other Countries of course, this would barely cause a ripple because the chart rules are different. The advantage of having greater freedom in song selection that this would bring might even outweigh the disadvantage of not being in the classical charts - and it might lead to increased sales, you never know.